President Dmitry Medvedev’s recent sacking of Primorye Governor Sergei Darkin just months before the APEC summit in Vladivostok this fall sent shockwaves through the Russian political community. As his successor, Medvedev nominated 44-year-old Vladimir Miklushevsky, rector of the Far Eastern Federal University. Artem Zagorodnov of Russia Beyond the Headlines sat down with Miklushevsky and the President’s Representative in the Far East, Victor Ishaev. RBTH: The APEC Summit is fast approaching and the region has a long way to establishing a strong and recognizable international image. What steps are being taken in this direction? 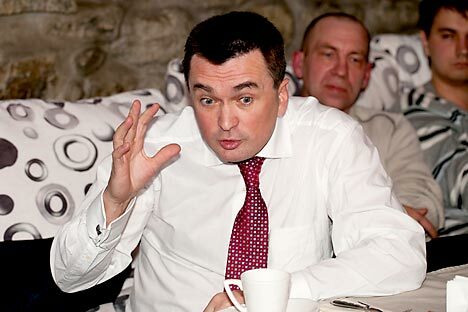 Miklushevsky: We have to look at establishing clear rules of the game. A major factor influencing them is corruption, which arises in some cases as a result of certain groups wanting to enrich themselves and in others simply because of a lack of transparency. Any businessperson needs to have an idea of when a given project can yield returns, and any changes to the rules lead to higher risks and a lack of predictability. Current ethical and corporate norms, both among Russian and foreign businesses (especially large ones), dictate that they don’t go where crime and corruption are present. Without working on these problems, we won’t get the trust of the local population and it’s won’t be possible to solve the socioeconomic problems facing the region. Solving them will in turn help us earn the trust of businesses that come here. I’ve formed a ‘White Book’ council where we ask foreign investors what problems they face to doing business here. While they cite the obvious problems with Russia’s climate, political and commercial factors in their own countries abound. They’re not eager to transfer technology and value-added production because they don’t want to see a new competitor. In the end most of the problems hurting our image have to be addressed nationally; it’s impossible to fight corruption in one particular region of the country. Society has to mature and the government has to mature. RBTH: Everyone I’ve talked to in Vladivostok is concerned about people leaving the region (in fact, the entire Far East) and demographic decline. How do you plan to solve this problem, and what sectors of the economy have the potential to attract people to stay here? Ishaev: In Soviet times people came to more isolated regions like the Far East; there were even songs about it. They were attracted by the bonuses the state paid them to move out here. We need these “federal bonuses” nowadays. We did surveys to find out what people need to stop moving away from here. The respondents told us obvious things – give us good jobs, give us adequate wages, give us housing, give us accessible healthcare and education. RBTH: Are there any positive examples of this? Ishaev: I worked for many years as governor of the [neighboring] Khabarovsk region, and we were able to achieve population growth. And not because people from Western Russia moved there, but because they moved from other parts of the Far East. Businesses moved from Vladivostok. I supported their development – I helped them get fair prices for connections to the grid and other state services. But European Russia is still developing more rapidly and approaching Western European standards of living. The Asia-Pacific region of the world is also developing, and we’re getting left behind. It’s like Russia is being torn apart from within. We used to send 75% of the products made here to the rest of Russia; now we face the opposite situation – we consume, and don’t send anything there. To reverse this situation we need to free new businesses from taxes until they become profitable – we can invite investors into special zones. Proposals for improving the business climate here have already been made to the President and we’ll see them announced during the APEC CEO Summit 2012, which will take place in Vladivostok at the beginning of September, where the development of the remote regions of the Far East will be discussed.